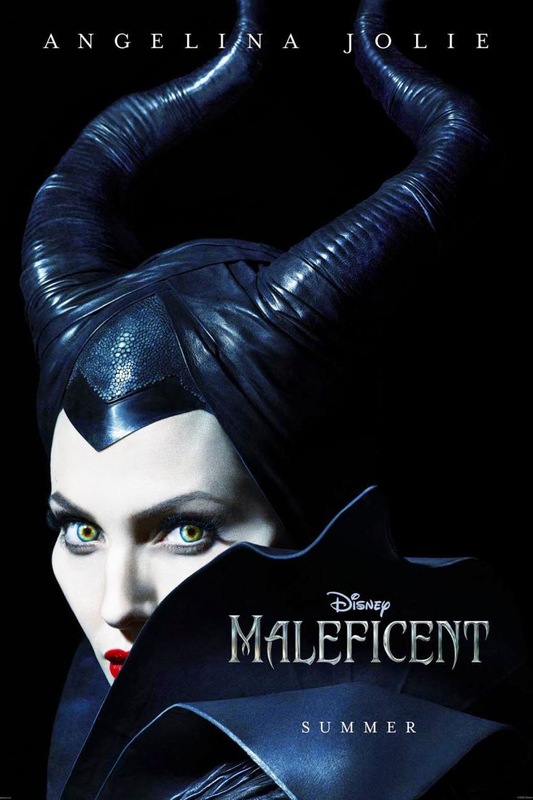 Before I begin my review of Maleficent I would like to make it known that I had been looking forward to this for about 2 years because Maleficent is one of my favorite Disney villains of all time, after all she is the self proclaimed mistress of all evil. So that said take my thoughts with a grain of salt. 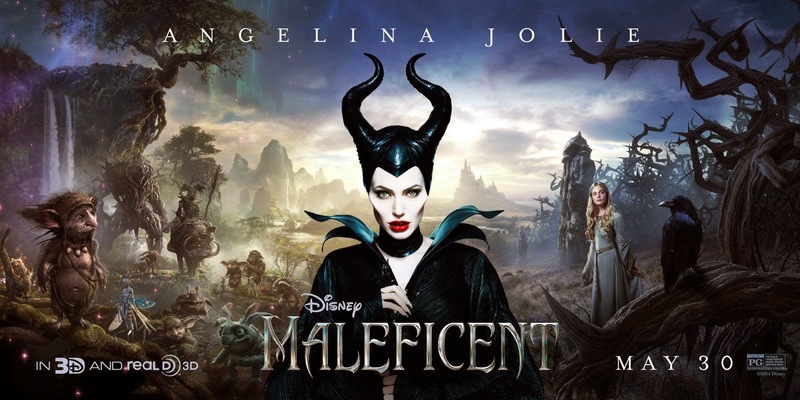 Angelina Jolie stars as Maleficent in this re-imagining of the classic tale of Sleeping Beauty boasting the animated classic from 1959 as its source material (or at least that is what the marketing would lead you to believe). However after seeing it twice now I've decided that it takes inspiration both from Wicked AND Sleeping Beauty, I won't list all of the reasons why to avoid giving spoilers but if you read the synopsis you'll understand why I say that. If you go in to this movie expecting Jolie's Maleficent to be the mistress of all evil and just see the story of Sleeping Beauty as told from her eyes then you will be very disappointed in the movie, I can say that because on my first viewing I felt fairly mediocre about it, but when I went back I told myself to pretend I had never seen Walt Disney's 1959 animated film and I fell in love with the movie. If I told you all the ways in which it differed from the animated movie I would be spoiling the entire movie and I won't do that for you so I'll break this down in to some of the biggest differences and similarities between the two then go in to my positives and negatives. The 3 good fairies from the animated film were named Flora, Fauna, and Merryweather, pretty easy names to remember if you ask me. In Maleficent their names are Knotgrass, Thistletwit, and Flittle (in the same order). Henchmen, in Sleeping Beauty Maleficent has (admittedly quite stupid) henchmen, she even called them imbeciles and fools. In Maleficent these creatures are nowhere to be seen. The presenting of baby Aurora, apart from a few lines here and there, looked as if it was right out of the animated movie just acted by real people. Angelina Jolie is superb as Maleficent and did a wonderful job capturing the feel of the character from voice to looks and for me was perfect in the role. The visual effects were breathtaking and well worth seeing on the big screen, personally I would argue they were more impressive then those of Avatar. The three good fairies are as well meaning but dim-witted as ever. 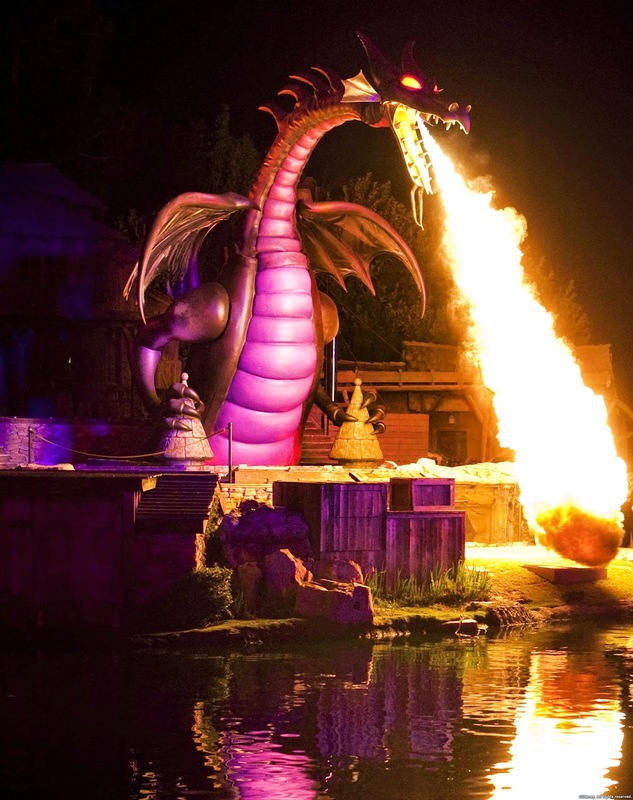 For us adults the moment that Maleficent loses her wings has a deep emotional response and when you see it you will hopefully be able to tell what it parallels for women in the real world. If Disney wanted us to believe that the 1959 animated movie was the main inspiration then why on earth did they change the names of the 3 fairies?? None of the other named characters were changed, just those 3 and it doesn't make sense to me. Her pet raven's name is Diaval, and I'm sorry but you can never quite make out what his name is no matter how many times it is stated. As great as she was in this Angelina wasn't 100% on in this, there were 3 individual scenes where I felt as if she was overdoing it, but none more so then about halfway in to the movie, and believe me you'll be able to pick out the 3 pretty easily. Elle Fanning's casting as Aurora, I still don't get it, Aurora was given the gifts of grace and beauty, so why didn't they get someone who would fit the "jaw dropping beauty" aspect of the character? Don't get me wrong, her performance as great but to me she seemed far to pale for the character. - I give it this high a rating because none of my "negatives" felt so bad that they made me want to score the film any lower, just things I would have loved to ask the producer and director about. I rate movies based on how I felt while watching and what the general reactions were in the theater as well. For me, this was up there as one of my favorites of the year and while X-Men DOFP was certainly a better made movie, I enjoyed this quite a bit more. 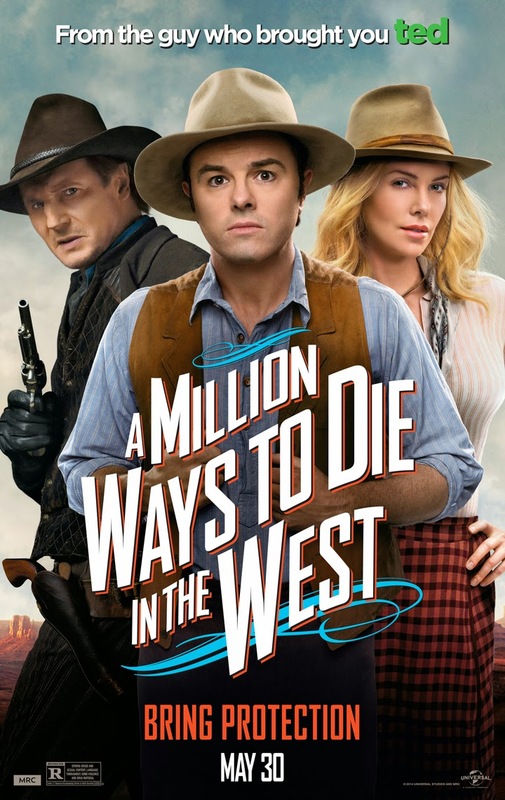 Seth MacFarlane's second live action full length film A Million Ways to Die in the West has his first leading role and he did a very fun thing with this movie. The movie stars Seth MacFarlane as the clumsy but smart Albert, Liam Neeson as Clinch the baddest outlaw in the West, Charlize Theron as new girl in town Anna, Amanda Seyfried as Albert's ex girlfriend, Neil Patrick Harris as the thinks he is funny guy Foy, Giovanni Ribisi as the loveable good Christian boy Edward, and Sarah Silverman as Ruth who works at the town whorehouse. The comedy was great in this movie I wasn't laughing every minute but the laughs I had were SO worth it. Liam Neeson - this was the first movie in a long time that I have seen Liam Neeson in that I didn't feel like it was just a new version of Taken plus he got some very entertaining moments. Cameos and bit parts - There are a few cameos in it that you won't want to miss but I won't tell you who or when they are but the bit parts are great. 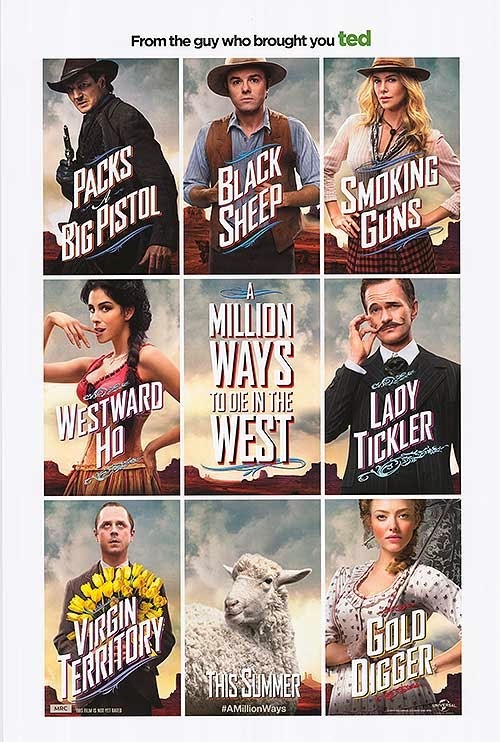 Western - This was a very fun western and while a few jokes took me out of the west, I had a very good time. Adult - this was a very adult movie that I wouldn't bring kids to in a million years, but it was great as it was and I'm glad it was an R rated comedy.